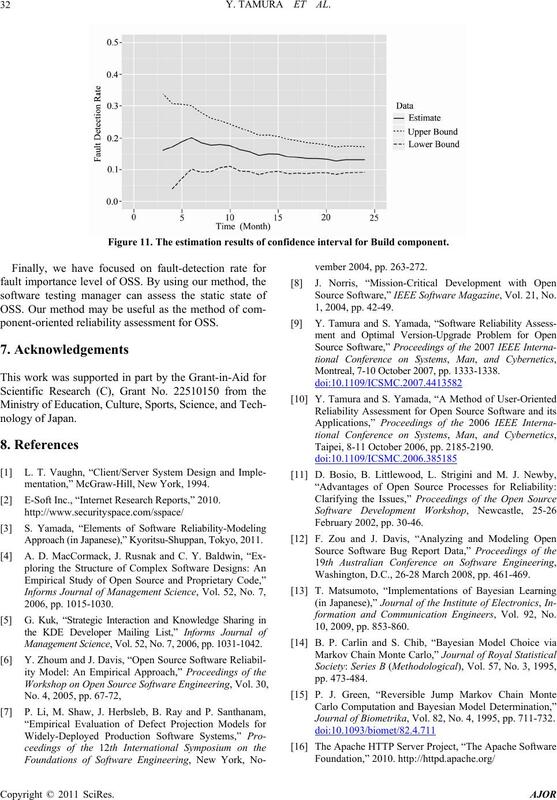 reliability for the whole open source software system by using the confidence interval for each component. quality, which prohibit the progress of OSS. than one of reliability assessment based on SRGM’s. ware s uch as Linux. 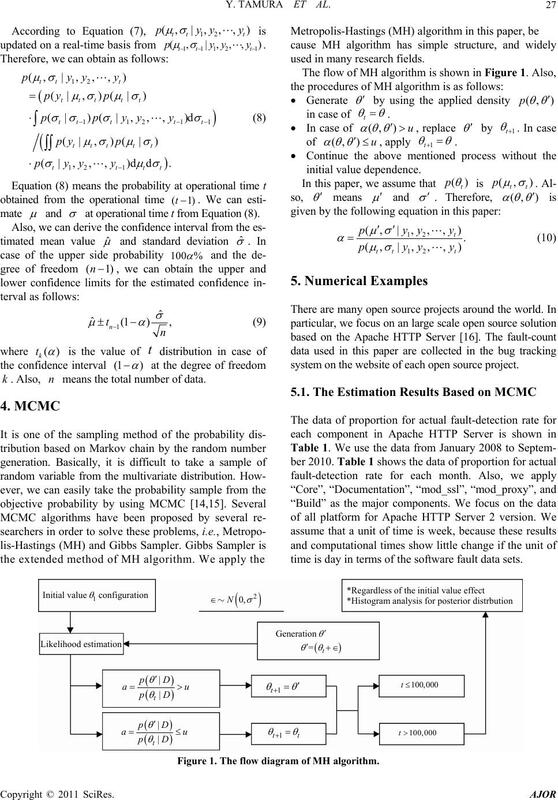 theory and Markov chain Monte Carlo methods (MCMC). used in many research fields. at operational time t from Equation (8). (, |, , , ). system on the website of each open source pr oject. time is day in terms of the software fault data sets. Figure 1. The flow diagram of MH algorithm. rate for each component in Apache HTTP Server. Table 2. Comparison of the estimate with the actual data. nent is the most affected one for the whole OSS system. proportion for act ual fault -detect i on rat e.
Figure 2. The estimation results for Core component. Figure 3. The estimation results for Documentation component. Figure 4. The estimation results for mod_ssl component. Figure 5. The estimation results for mod_proxy component. Figure 6. The estimation results for Build component. according to be removed the faults of small components. 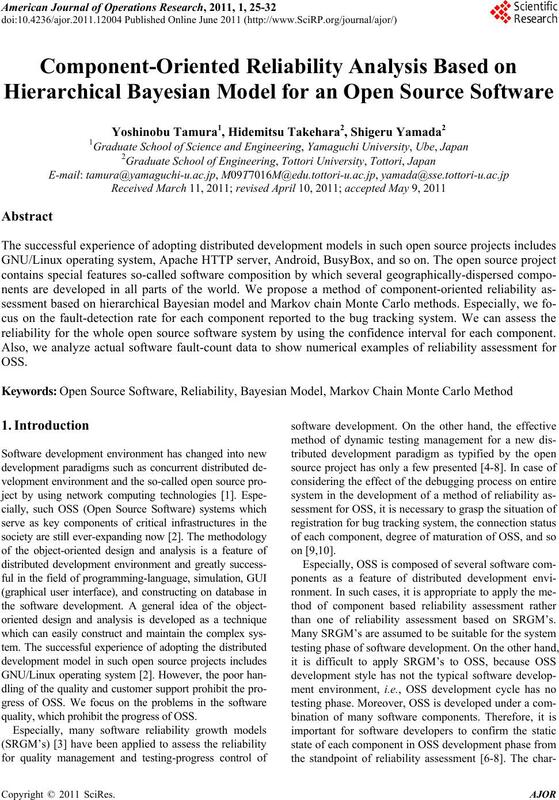 In this paper, we have focused on the reliability of OSS. that the open source project keeps a high active state. stable in terms of the occurrence rate of “Core” component. Figure 7. The estimation results of confidence interval for Core component. Figure 8. The estimation results of confidence interval for Documentation component. Figure 9. 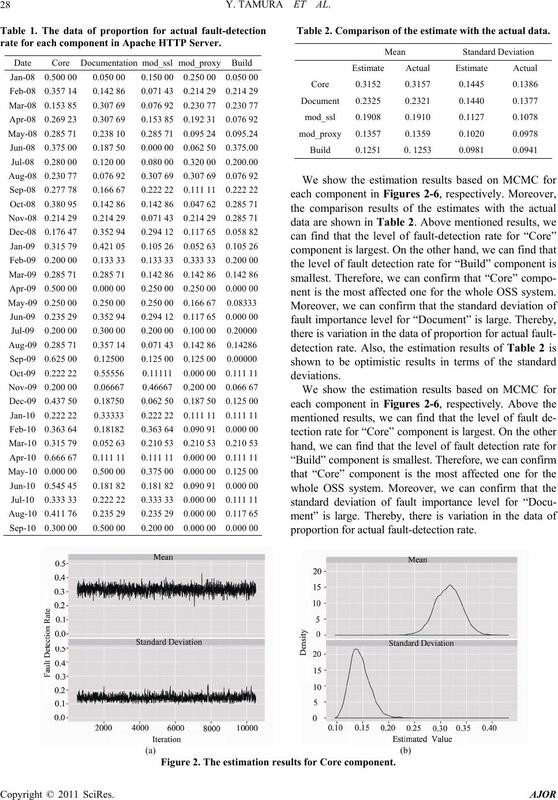 The estimation results of confidence interval for mod_ssl component. Figure 10. 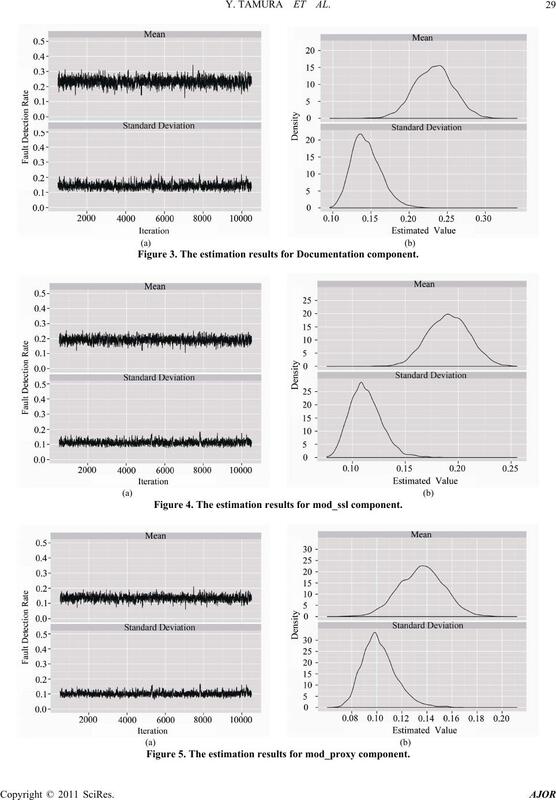 The estimation results of confidence interval for mod_proxy component. Figure 11. 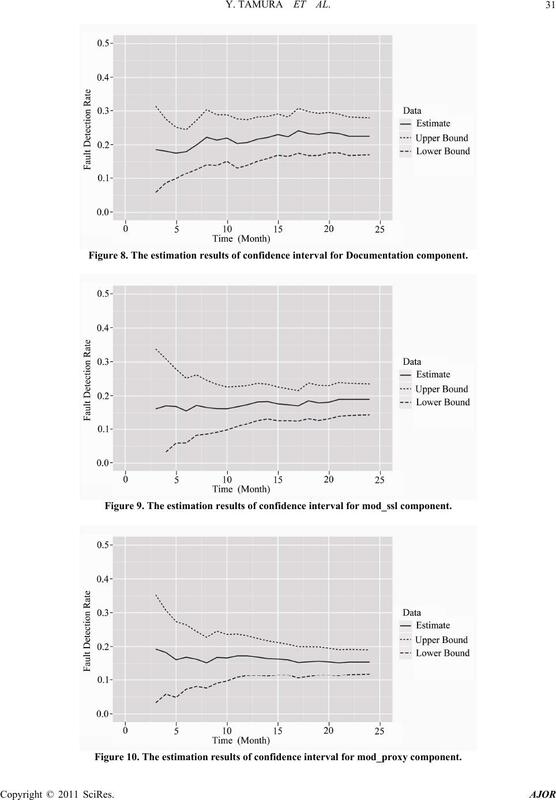 The estimation results of confidence interval for Build component. ponent-oriented reliability assessment for OSS. nology o f Ja p an. mentation,” McGraw-Hill, New York, 1994. E-Soft Inc., “Internet Research Reports,” 2010. Approach (in Japanese),” Kyoritsu-Shuppan, Tokyo, 2011. Management Science, Vol. 52, No. 7, 2006, pp. 1031-1042. 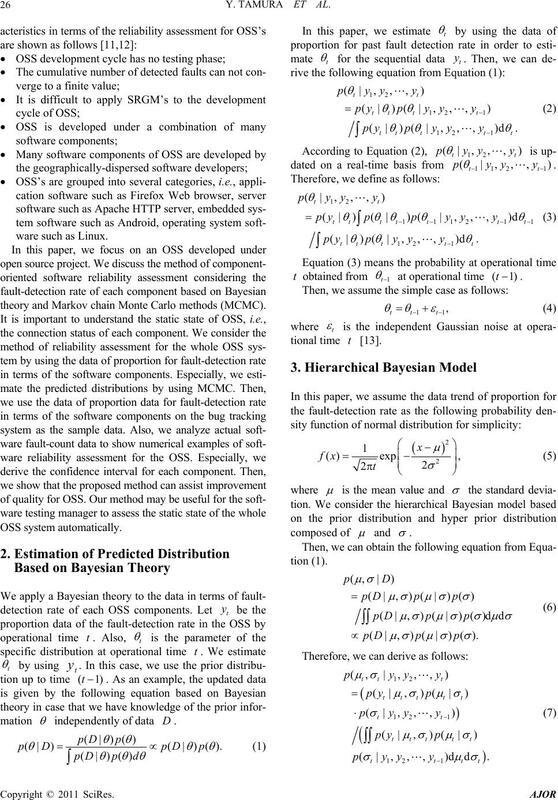 Source Software,” IEEE Software Magazine, Vol. 21, No. Montreal, 7-10 October 2007, pp. 1333-1338. Taipei, 8-11 October 2006, pp. 2185-2190. Washington, D.C., 26-28 March 2008, pp. 461-469.
formation and Communication Engineers, Vol. 92, No. Journal of Biometrika, Vol. 82, No. 4, 1995, pp. 711-732.